How To Get The Most Out Of Your Limited Time. 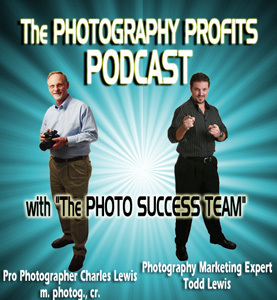 Todd Lewis here at Charles Lewis Photography. Photographers are artistic people. I don't know a single photographer that got into the photography business with dreams of "striking it rich." That doesn't mean, however, that photographers can't make a great living doing what they love most. One of the keys to great success in any endevour you undertake, is effective time management. In addition to being a photographer, you are also a human being, with other desires and responsibilities, all of which are tugging at you for a piece of your 24 hour day. Plus, as a photography business person, you can't just spend all your time "snapping pretty pictures." You also have to meet with clients before hand, develop your images in the lab (if you do that yourself), travel to locations to scout them out before sessions, etc. - the list goes on and on. As I'm sure you've experienced, sometimes it seems the day is gone before it's even begun. So, how does a photographer get the most out of his or her day? Effective time management has been the focus of countless books, seminars, and self-help cassette programs for the last 3 decades. I've even penned myself a little book on the subject called "Unleash the Power," which is geared specifically toward time management for photographers. If you do not already own this guide book, call 1-800-645-5199 to get a copy. On this page of the cjlewis.com site, I will talk briefly about some of the key points to think about when trying to manage your time wisely. 1. Do Not Procrastinate! Putting off tasks till (or past) the last minute will only cause you to feel overwhelmed, and more behind than ever. In fact, it often helps to do the things you don't want to do the most FIRST, so that you get them out of the way. This way you are less likely to get roped into doing what I call a "diversionary project," which is basically a project that may not be very important, but is more interesting to you than the project you really should be focused on at the time. 3. Prioritize Your Things-To-Do By Importance and Urgency! Spend 15-30 minutes first thing each day planning out what you need to accomplish that day. Then, assign a number to each of those items based on what needs to be done first. Stick to that all day long, and do ONLY the items on that list, and do them ONLY in the order of most important and urgent first. Anything on that list you do not get done that day, put on the top of your list for tomorrow. 4. Minimize Distractions and Interruptions! Nothing can ruin your plan for success easier than distractions and interruptions. If you are working on an extra-important project that needs extreme focus, make sure you can not be interrupted by phone calls, staff questions, or even family and friends. This is a delicate area as you must be very tactfull (especially to family and friends) when stating that you need to be uninterrupted for a period of time. If you find it difficult to be uninterrupted in your home or office during an important project, try to go somewhere else such as a library or bookstore to work. 5. Never Lose Sight Of Your Ultimate Goals! Everything that you do in the day should help you get closer to achieving a goal of yours. Even if one of those goals is to "take time to relax and have fun," your activities most certainly must reflect these goals. Don't let yourself get pulled into projects that are not helping you toward the attainment of your goals. That's not to say you shouldn't help others if they need help in the day, but you should not make a habit of allowing things outside your goals to regularly run your day. Do you have your goals laid out for yourself? I'm willing to bet that you don't. Studies have shown that less than 5% of all people living in the U.S. have their goals clearly defined AND WRITTEN ON PAPER. Do you have your short and long-term goals written down in detail on paper? If not, you have your first project already laid out for you. That's just a short list of some of the basics of Time Management. Once again, my guide book "Unleash The Power" goes into more detail on this subject, and even gives you a "Success Blueprint" - a series of forms to help guide you to self-mastery and effective time management. You can call 1-800-645-5199 for more information, or CLICK HERE to send an e-mail, and tell us you want more info on the "Unleash the Power" guide.